Dichotomy is a representation of the worlds that have been created because of the life and forces that exist in our world. These atmospheric forces make it possible for these beautiful worlds and ecosystems to exist and thrive on our planet. I created these engaging worlds because how I wanted to illustrate how lucky we are to have these beautiful forces that protect us and make Earth the beautiful, habitable place that is. Samantha Kaplan is a New York- based artist from Westchester, NY. 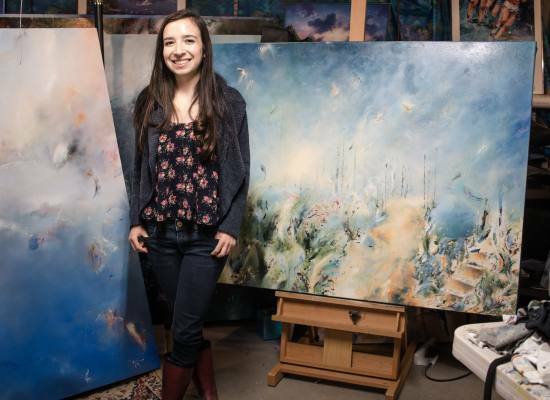 She recently earned her degree in a Bachelor of Fine Arts in Painting and Drawing and a Bachelor of Arts in Theatre Arts from the State University of New York at New Paltz. Her work has been exhibited in the Samuel Dorsky Museum of Art in New Paltz, NY, the Art About Water exhibition in Newburgh, NY, the Bruce Museum in Greenwich, CT, and at the Katonah Museum of Art in Katonah, NY. The original painting will be shipped rolled unless otherwise requested. Please note that this painting is being shipped from New York. It costs $1500 to ship the original painting stretched. Since the painting is currently in an exhibition, it will be shipped on June 30th. If shipped rolled, the painting will be shipped with poly and microfoam surrounded by an outer tube with wooden end caps. If shipped stretched, it will be sent in an international shipping crate. Please note: this painting will be shipped with art shipping company to make sure that it arrives at your door in perfect condition.